The story that follows was written by the American archaeologist Carl W. Blegen (1887-1971) at an unknown time, most likely to be read at the Literary Club of Cincinnati. It was recently re-discovered by Professor Jack L. Davis of the University of Cincinnati among the papers of Blegen’s close friend and co-digger at Pylos, Marion Rawson. In his own phlegmatic style, Blegen narrates a major change that took place in Greece exactly ninety years ago: the country’s switch from the Julian to the Gregorian calendar. I thank Jack for sharing Blegen’s manuscript with me. 1923 was a difficult year in the political history of Greece. In the aftermath of the Asia Minor Disaster in the late summer of 1922, Greece witnessed the influx of more than a million refugees, the abdication of King Constantine, and the establishment of a revolutionary regime by colonels Nikolaos Plastiras and Stylianos Gonatas in September of 1922. On November 28, 1922, six politicians including two former prime ministers were executed at Goudi, an act that shocked Europe and America. Blegen had known some of them personally. In July 1923, the Lausanne Treaty delimited the borders of Turkey, Greece and Bulgaria, and by the end of the year, the revolutionary regime of Plastiras and Gonatas was finally able to restore some semblance of political order and lead the country to elections. 1923 was also a tumultuous year in Blegen’s personal life. In January he was engaged to Elizabeth Denny Pierce, who broke the engagement (and his heart) a few months later. That summer and fall found Blegen somewhat disillusioned as he tried to win Elizabeth back, which he eventually did, albeit under certain conditions that would irrevocably alter the course of his life. “In spite of a reputation for violence, disorder and general lawlessness, the people of the Balkan countries have always been with relatively few exceptions a quiet, respectable, and until recently, a highly conservative folk. Most of them were content to accept what was handed down to them by their fathers, and on the whole they have held soberly and tenaciously to their own local traditions. Especially in matters concerning their religious faith and in the relations between church and State they have stood firmly against the encroachments of the modern age and have usually resisted the introduction of any change. This attitude has been particularly well illustrated in their retention of the old calendar, which to westerners long constituted a chronic and perennial source of difficulty and confusion. For the Eastern Orthodox Church continued stubbornly to adhere to the Julian system through many centuries after the Catholic Church and west European nations had adopted the Gregorian modification. 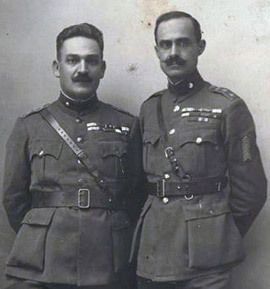 Colonels Stylianos Gonatas and Nikolaos Plastiras, ca. 1923. The calendar was in fact the peculiar concern, not to say property, of the Church which used it primarily to fix the religious facts and festivals; and the latter were of course far more important to the people than the newer secular holidays. Consequently any attempt from outside to lay hands on the calendar was a direct interference with the affairs and prerogatives of the Church, and as such met with vigorous rejection. Balkan kinds thus moved sedately along on their courses, content to lag many days behind the western world. It was a somewhat rude shock to many of them when the year 1900 rolled around, to find that they had suddenly dropped back yet another day in their reckoning; and business men, in dating letters, had to learn to write 1/14 February, for example, instead of 1/13 as they were previously accustomed to do. The rapid expansion of communications in the first two decades of the twentieth century, especially the completion of railway lines linking Europe with the Near East and the resulting increase in commerce and in general business relations, and also in no small degree the impact of the First World War had widespread affects in the Balkans. New ideas began to penetrate more powerfully than before into social consciousness, and the old conservatism became tinged with more progressive conceptions. Even the thought of change ceased to be alarming. It was like an awakening from a long sleep; rubbing their eyes the people looked about them and began to realize that they, too, were a part of the great world, and no longer formed a detached group living in geographical isolation by themselves. As other innovations were accepted –such as the adoption of eastern European time- voices began to be heard suggesting a reform of the calendar. Business men had long been convinced that such a measure was desirable, since it would obviate the need for double dating in correspondence and would greatly simplify the keeping of records. Liberal elements in the ecclesiastical hierarchies also were inclined to look with favor on the suggestion. The first action came in 1916 when on January 27th Serbia adopted the Gregorian calendar for the State, though retaining the Julian for the church. Bulgaria went a step farther, on March 22nd of the same year, when the Gregorian was accepted as the political and ecclesiastical calendar of the country. The effect of the change in these two states soon made itself in the more remote and less exposed Balkan lands, but some years had still to pass before Greece and Rumania were ready to act. Happening to be in Greece in 1923 when the question came to a head, I had a good chance to observe the course of events, and the matter was not without interest. It took a thorough –going political revolution to impose the actual reform. A previous government some years earlier had appointed a commission to study the problem; its work was conscientiously done and the report submitted was favorable to the innovation, provided the agreement of the other Greek Orthodox churches could be secured, but no one took the initiative to carry the project to completion. But in 1923, following the military disaster of the preceding autumn in Asia Minor, a revolutionary democratic regime was in power; it had deposed and banished King Constantine, and had introduced many other changes easily and simply, merely by issuing decrees. Why is it that revolutionary governments are so fond of attacking and replacing innocent and unresisting calendars I do not rightly know, but the “Reds” of the moment often seem to derive a peculiar satisfaction from such an act. Perhaps it is one of the best methods of expressing complete independence. 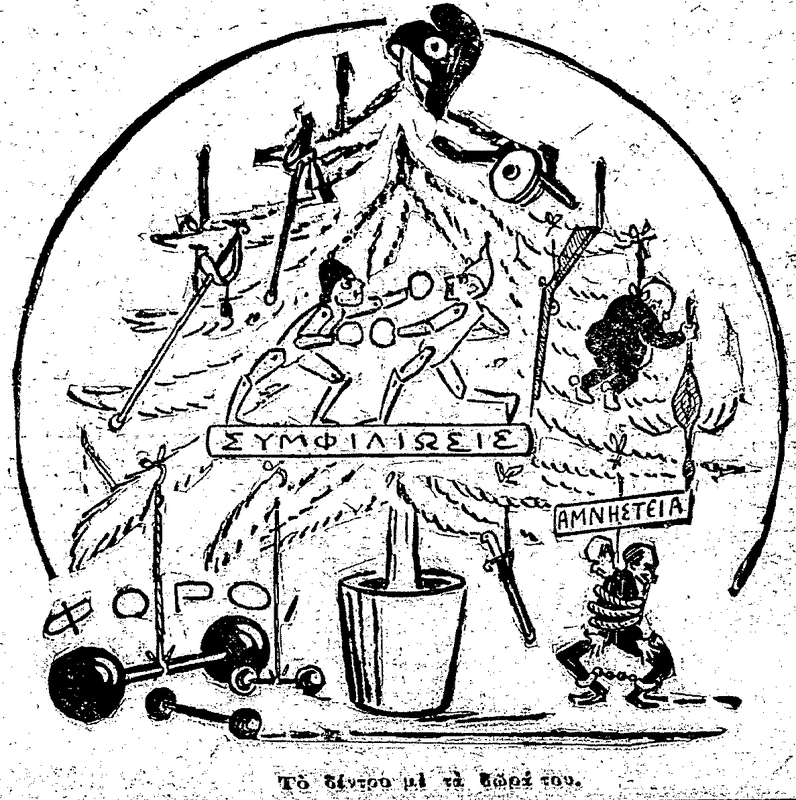 This cartoon was published on “Σκριπ” at Christmas Day, on January 7th, 1924. The new year was bringing heavy taxation, but also hope for reconciliation and political amnesty. Click to enlarge image. In any event, the revolutionary cabinet of Col. Gonatas, having in its turn named a committee including a churchman, a layman and a lawyer, to make a preliminary examination of the question, by a decree issued January 18th established the Gregorian calendar as the official calendar of the State. It was put into effect on February 16th, which automatically became March 1st, and henceforth in her political and business life Greece followed the western system of dating. But the rapidity with which the change was brought about had caught the Church in a state of unpreparedness, unable to act with equal speed. And it must be admitted that the ecclesiastical authorities in struggling with this problem faced far greater difficulties and complications than the political regime. But machinery was promptly set in motion in the hope that a satisfactory solution might soon be found. In the meantime the year of 1923 proceeded nonchalantly on its way, regardless of Church and State and perhaps chuckling to itself at the curious joke it was about to spring on both. When December arrived and thoughts turned to the approaching holidays, the majority of the people to their consternation suddenly became aware of what the intelligent few had long known, that something rather odd was about to happen. For Christmas, being a Church festival for which the devout prepared by a fast of forty days, was fixed by the Julian calendar; while New Year’s day, as a political holiday, set aside for feasting and rejoicing and the paying of innumerable social calls, when egg-nogs and strong drinks were served, was as inexorably determined by the Gregorian reckoning. Thus New Year’s Day was destined to come before Christmas, early in the final week of the solemn fast when gayety and indulgence in festal food and drink were not permitted to the pious. It was an awkward situation, but nothing could be done about it; the average citizen therefore shrugged his shoulders and went about his business, leaving those who had time and who wished, to worry about the strange conflict of calendars. And so the political year of 1923 had no Christmas. The devout continued their fasting through the legal New Year’s Day and quietly celebrated the festival of the nativity on the 6th of January; the worldly were little concerned, but perhaps took an extra drink with a cynical comment on the dilemma when they saw the new New Year in. Startling political events speedily overshadowed the question of calendar, and popular feeling soon ceased to be much disturbed by the shift of 13 days when Greece emerged from the revolutionary turmoil as a formally proclaimed full-fledged republic. 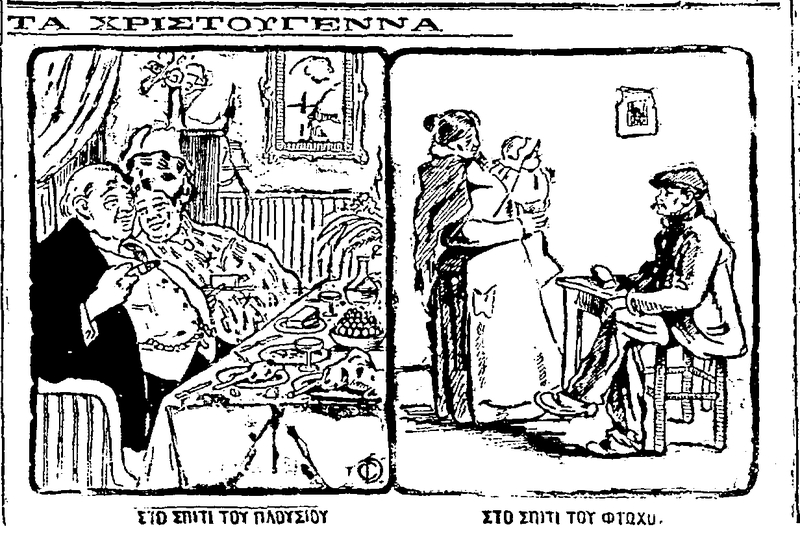 The “Ριζοσπάστης” cartoon on January 7, 1924 ridiculed the Christmas of the rich. Click to enlarge image. All this time, however, the authorities of the Church had been busy with the problem, and on the 28th of January 1924 they were able to reach a decision. Reserving the right to determine the great holy day of Easter and its dependent feasts by the old rules based on the Julian calendar, they adopted the Gregorian for the rest of the ecclesiastical year and for all fixed festivals. The new order went into effect on the 10th of March, which became March 23rd, and therefore Church and State were again united in reckoning the days, although a small but vociferous body of recalcitrants, known as Palaiohemerologites, stubbornly refused to accept the change. The political year of 1924 of course had two celebrations of Christmas, one on the 6th of January and one on December 25th; but the ensuing years reverted to the normal.